For those who never underestimate the power of the dark side. •Lose your head (or Anakin's) over this Vader helmet-shaped toaster. •Each bread slice emerges with a branded Star Wars logo. •Three darkness setting; UL listed. •Plastic and metal; 12 1/2"H x 9 7/8"W x 9 1/4"D.
•For use in US and Canada outlets only. •Only ship to US and Canada. As the two suns rise over Tatooine (or just that single one over Earth), you'll make your toast and marvel at Star Wars logo branded into it. 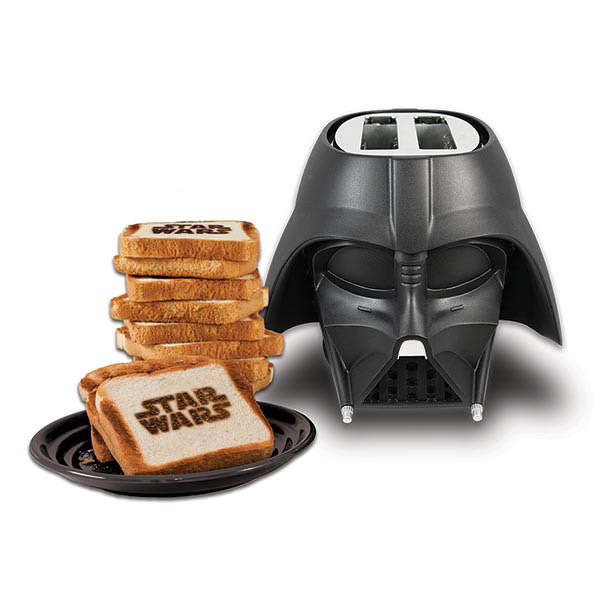 Be the first of your friends to place this on the countertop: Darth Vader's helmet, dispensing perfectly prepared breakfast bread. Officially licensed; 3 darkness settings. Plastic and metal. 12 1/2"H x 9 7/8"W x 9 1/4"D.